Don’t let mosquitoes takeover your home. 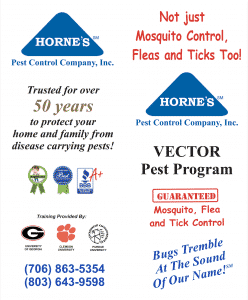 Horne’s Pest Control mosquito control service plans can keep mosquitoes out of your yard. Don’t let Mosquitoes ruin your summer nights! Mosquitoes seem to be becoming more of an issue as of late. Some entomologists believe, that as a result of global warming, diseases carried by insects will continue to increase. It is believed that since the beginning of time – mosquitoes are responsible for one half of all human deaths. This is more than all other causes combined. Even today, Malaria infects about 250 million people annually with more than a million cases resulting in death. West Nile Virus outbreaks appear to be happening with more frequency and its spread is directly linked to mosquitoes. Understanding basic mosquito biology and habits has led to new-found successes in the area of mosquito control. There are about 175 species found in the U.S. They need water to breed and grow from eggs to adults, and they can do this in about 5-14 days. It does not need to be a lot of water. Old tires, abandoned buckets or bird feeders etc., are all ideal for these insects. Females lay up to 300 eggs at a time and lay eggs three times during their life. The mosquito life span is usually less than 2 months and males often live only 10 days or less. Mosquitoes mainly feed on plant and fruit nectar, but the female needs protein from blood in order to develop and lay eggs. Male mosquitoes do not bite people. Most mosquitoes cannot ﬂy very far (1-3 miles) nor very fast (1-1½ mph) and as a result, most mosquitoes will remain within several hundred feet from their breeding ground and where they are hatched. Mosquitoes can generally detect a host from a distance of about 100 feet or less. 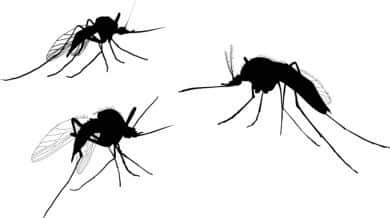 Mosquitoes are attracted to the carbon dioxide we exhale, lactic acid and octenol in our breath and sweat, and the heat and humidity that surrounds our bodies. There are many remedies for mosquitoes such as: skin so soft, dryer sheets, vitamin B, candles, bug lights, etc. Most of these have either been proven ineffective to marginally effective by the CDC. Mosquito control services are effectively accomplished through a multi-step process. First, we empty any items that are holding water and apply a larvacide to any large body of standing water in which mosquitoes can breed and larvae survive. Second, we apply a liquid insecticide to the low shrub and grassy areas in which the mosquitoes might seek shelter from the heat of the day. It is also important to provide this treatment during the heat of the day when most mosquitoes are resting. Third, we apply a mosquito treatment to the bottoms of the plant leaves that mosquitoes feed on. This three step process, when done properly by a trained Horne’s technician, will provide excellent control around your home for several weeks. The adults are killed where they rest and feed and the larvae are killed where they live. Since mosquitoes will not generally travel more than a few hundred feet and can only detect a human from up to a hundred feet away, a proper application in and around a home’s landscape will be very effective. In addition to the above treatment, we also place a mosquito control canister in your yard. This supplement aids in controlling the mosquito population by both killing the adults but also killing the larvae. 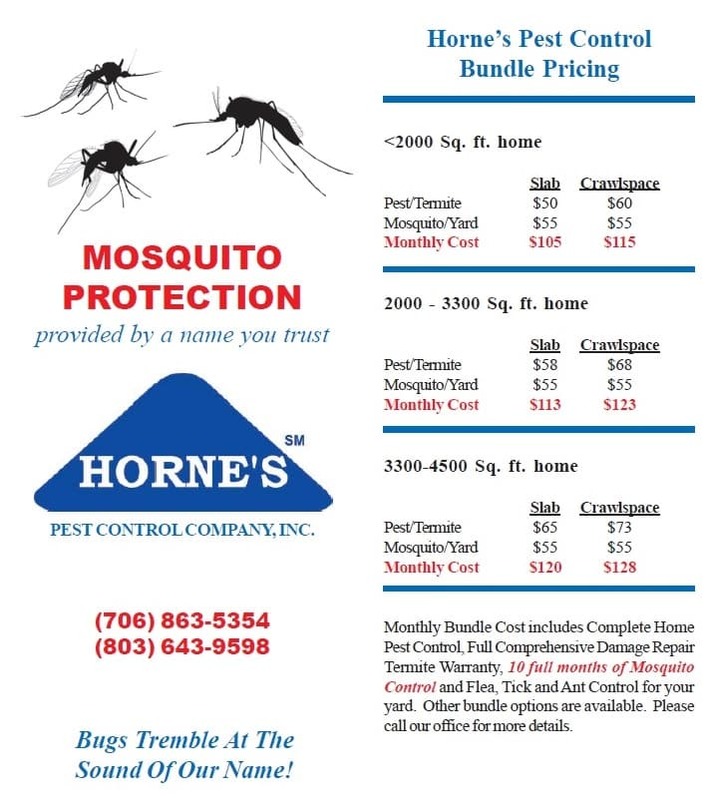 If you are a current customer and wish to add mosquito control, we ask that you please see our Bundle Brochure and receive a discount!